This was a totally thrown together, last minute trip. On Wednesday we just figured we might as well go camping this weekend. 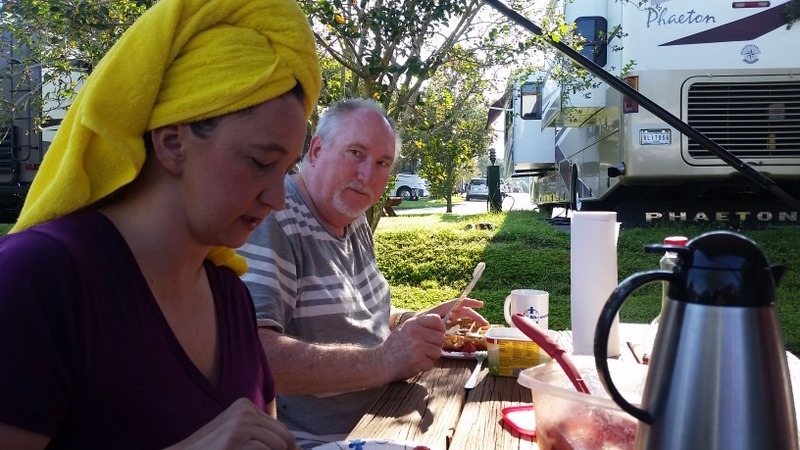 Our search for something around St. Augustine proved fruitless, so we figured we try out the RV Resort at LazyDays in Tampa. 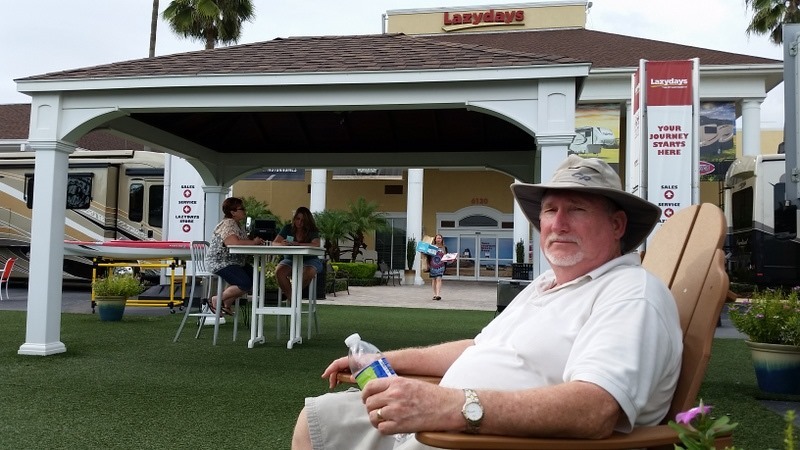 We drove over Saturday morning, stopping for lunch at Sonny’s in Lakeland on the way. Arriving at about 1:45, and setting camp. 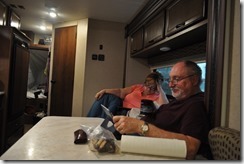 At the campground, we explored the property and walked over to the dealership to look at the new RVs. 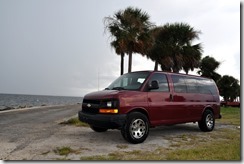 Jennifer and I have been tossing around the idea of putting a 5th wheel in to our upgrade plan, rather than a class A. At LazyDays, we saw the 5th we want; Montana 3791RD. For dinner, we decided to head out instead of cooking out. The weather was not conducive to grilling. Based on Yelp recommendations, we ate at Shamrock’s Ale House, which left much to be desired. One would think that a Irish sports bar would be busy on a Saturday night, but we were one of only about 4 tables there. 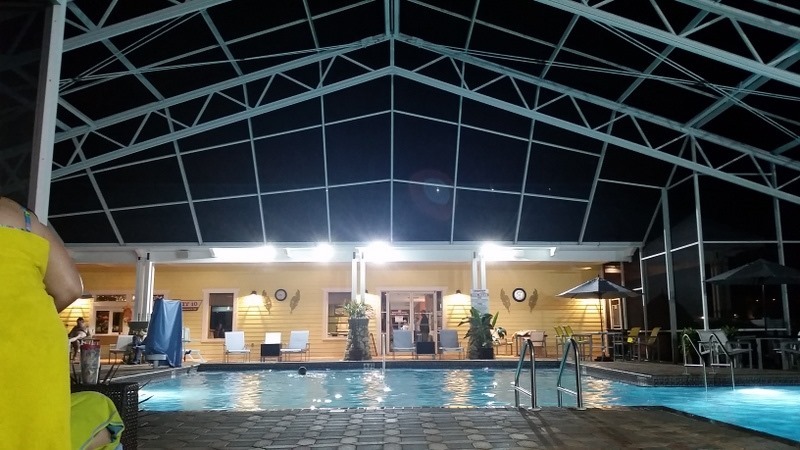 After dinner, we went for a dip in the wonderful pool at the campground. It is very large and is completely screened in. It is open until 10PM, which was great, but it is short on lounge chairs. Sunday after breakfast we headed toward Clearwater Beach, stopping off at Costco for a little shopping. Our plan was to get lunch near the pier and hang out at the beach, but apparently everyone in Tampa had the same idea. Traffic was horrible and there wasn’t beach parking anywhere. 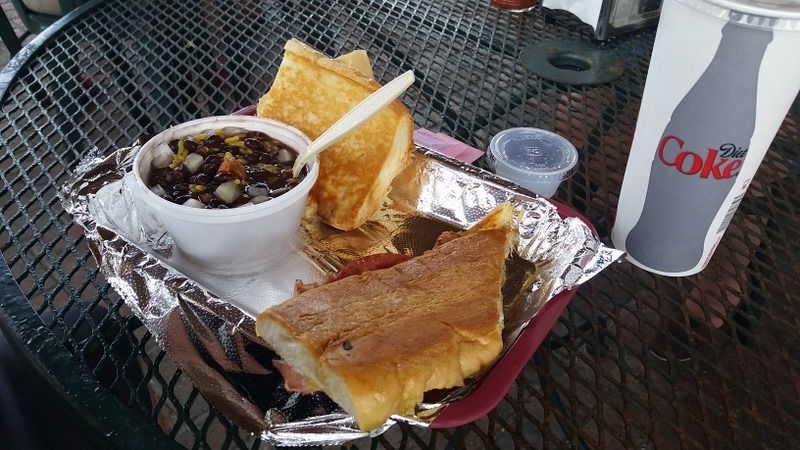 instead, we drove south toward Treasure Island to go to my favorite place on earth for Cuban sandwiches, The Floridian. We took the scenic route back, crossing over the Sunshine Skyway bridge, and stopping to enjoy the view of the storm rolling in. Back at camp, cooked dinner then played a little Mexican Train dominos before calling it a night. Monday morning we woke up to rain, non-stop rain. Our plan was to exploit the free late checkout and hang out for the day. But with the weather that seemed pointless. Instead we decided to pack up camp and head to Orlando Ikea, before heading home. Activites – Great place to go with kids. This particular weekend they had a camp fire, s’mores and a movie in the park area. 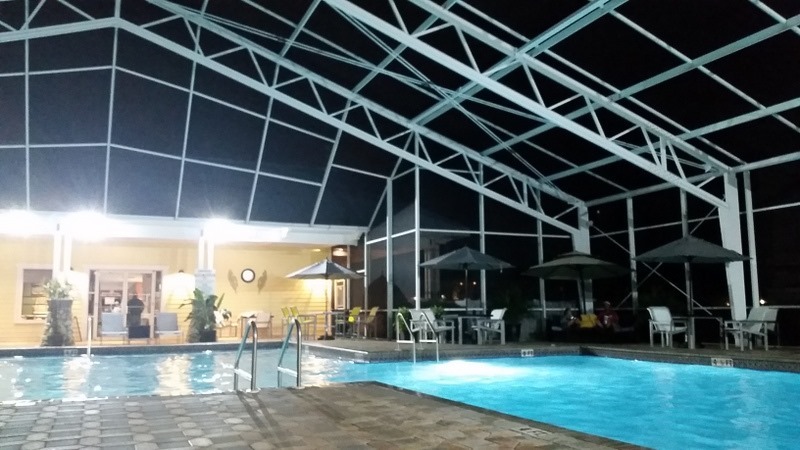 Pool – The only large screened-in pool at a campground that I know of. They even serve food and drinks. Free Late Checkout – Don’t know the details on how/why we got this, but we were told as long as we left by 4PM, there would be no extra charge. 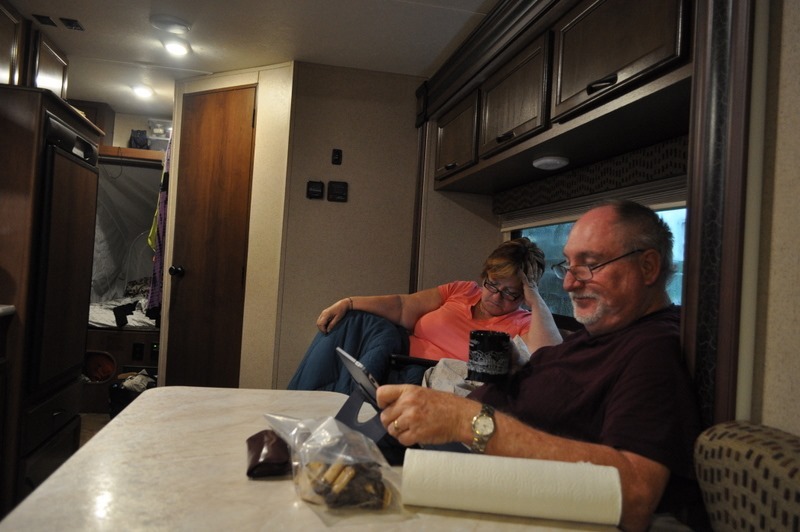 Lack of Bathrooms – While the entire property is full hook up, meant for fully self contained RVs, many people make use of campground showers, toilets, etc. There are 300 sites, with two toilets and three showers. Parking on sites. No more than one vehicle can park on each site. Ideally get an outside spot, so that another camper is not backed up to you. We had a newbie in a diesel pusher right behind us. He apparently thought that he had to start his rig up every day. All his exhaust blew right in our patio area.